MONTEREY, Calif. (4 September 2018) – With the 2018 IMSA WeatherTech SportsCar Championship entering its final stages, points-leading Whelen Engineering Racing will be looking to score its third-consecutive podium finish at WeatherTech Raceway Laguna Seca in the America’s Tire 250 this Sunday (FS1 coverage starts 5:00 PM ET). Eric Curran and Felipe Nasr, drivers of the No. 31 Whelen Engineering Cadillac DPi-V.R, enter the penultimate round of the championship with a seven-point lead over the field of IMSA Prototype machines. 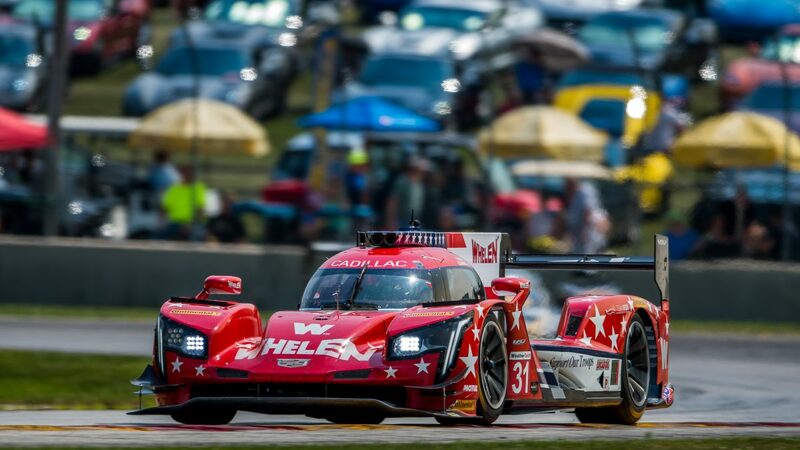 Whelen Engineering Racing is coming off a third-place finish in the most recent Prototype event at Road America in August – a finish that added six points to their championship lead. But that lead hasn’t changed the preparations for the team as IMSA is set to stage another highly competitive sprint race with three classes in action. This will be the first visit to the storied 11-turn, 2.238-mile circuit for Nasr, who joined Curran earlier this season in winning at Detroit’s Belle Isle Circuit among five podium finishes in eight races. However, the former Formula One pilot has quickly come up to speed on the unfamiliar circuits. Nasr won in his first visit to Detroit’s Belle Isle Circuit earlier in the year. He also finished second in the season-opening Rolex 24 At Daytona – one of the few events Nasr has raced in the past – and scored second place results with Curran at Sebring, Canadian Tire Motorsports Park and Road America. Unlike his teammate, Curran has plenty of experience at Laguna Seca, dating back to his days in the former Grand-Am Rolex Series, where his best finish was in 2013 when he drove a Whelen-sponsored Corvette for Ted Marsh. In the WeatherTech Championship, Curran and former co-driver Dane Cameron finished third in 2016, driving a Corvette DP, and second last year behind the wheel of the No. 31 Cadillac DPi-V.R. Practice will open the weekend on Friday, with Saturday’s 15-minute qualifying session setting the grid for Sunday’s 2 hour, 40-minute race. The season concludes with the Motul Petit Le Mans at Road Atlanta on Saturday, Oct. 13. Follow twitter.com/ax_racing for updates and visit http://axracing.com for team information, photos, and additional updates.